A blog about running. marathons, ultra marathons, trail running. With product and event reviews and commentary. 2019 is going to be filled with a lot of races. I need to save and record some of my experiences. I expect 2019 to be a great year of running. I got up and it was cold. 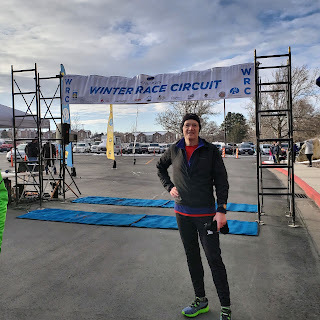 This race is the coldest race I've ever done. Standing at the start waiting for a timing glitch to be worked out did get feel pretty cold. But then once I got running and there was a head wind, it felt much colder. Going in to the race I didn't really do a lot of research on the course and I didn't know what to expect as far as uphill or downhill. I was really expecting it to be more or less flat. But I was wrong. With my expectation that it was going to be pretty flat I was hoping for any time less than 20mins would be a good time for me. 18 minutes and something would be great. Once the race finally started I got going. And from that point I rarely looked at my watch. I just went as fast as I though I could. I was right near the front when we started and after the first quarter mile or so there were about 15 people ahead of me. Maybe? Anyway, I just went as fast as I felt I should go knowing that it was a short race. I wasn't really concerned about the people ahead or behind. I was just trying to do my thing. Once we got about a mile in there was a hill. And I did pass one or two going up the hill and I just kept going. At some point, maybe about 2 miles, I tried to count the people ahead of me. Unless there were some really fast people a head of those that I could see I figured I was about 7th place or so. Finally the last mile I found some folks who had gone out too fast and they just bonked. I passed them while trying to encourage them to keep going. I didn't chase anyone else down and I was fairly confident that no one was behind me that was going to catch me. I couldn't stick around at the end of the race but once I got the results I was happy with how things went. I was the 4th place male. I was first in my age group. The official time was 19:42 - And with the hills and the wind and the fact that I was just on the tail end of running a 50 mile week. I am very happy with this result. First off is that I didn't expect much going in. My training was deficient enough that I couldn't reasonably expect a PR. I wasn't really mentally focused going in either. It was only a few days before the race that I actually did some math to figure out what I should expect. After some back of the envelope calculations, I decided that I could probably pull off a 3:20 but I would hope and try for 3:10 to get another Boston Qualifying time (even though I have no intentions on using my time to run Boston). Picking up my bib at the expo went fine. I was able to get in and out without waiting which is the way I like it. The bag was still mostly filled with stuff that went straight in to the trash. Sorry, adverts in my bag don't get read by me. So I got everything ready (food, clothes, watch) and went to bed. Got up and made it to the buses and up to the start. The buses were actually really nice and I managed to fall asleep for a few minutes. I guess I wasn't feeling chatty. Once at the start I had some time to kill. I ate some food and walked around. Having never been a to this area before I was stunned by how pretty it was in the canyon. After the normal waiting and quick stop at the lovely porta-johns, the race started. Thank goodness, because my hands and feet were freezing. Of course I started out way too fast. I figured since there was so much downhill that I couldn't not take advantage of it. I was feeling fine and just kept going. I was on track for besting my goal. The first few miles went by just fine while I tried to find my rhythm. Eventually my stomach had some issues, but since I didn't have a say in the matter about 75 seconds at a porta-john took care of that. I was still feeling good and was on track. I was also feeling sticky on my face and hands from the powerade and gels, but hey, that's what I race is all about for me. I'm not about to worry about spilled drink on my shirt. Once at the halfway mark came I decided my brain needed a strategy to survive what I was sure was going to be a grueling second half. Because I was feeling good and running too fast I needed a way to help me get through the rest of the race. I was pretty certain I was going to bonk before the end. I decided that I was going to just get through each mile and run one mile fast and then one mile slightly slower and go back and forth for the rest of the race or until I couldn't do it any more. It worked from mile 14 to about 23. At 23 there was a turn around and then a good headwind that, while was certainly strong, I was able to push through alright. I passed a few people too. It's always nice passing people in the final miles of the race because you're feeling good and still have some strength left. One thing I though was funny was that there was an aid station at about 23.5 that was on the outside edge of a corner on the course. Even if it was only a few extra yards, no way was I going to run the extra distance to get anything from there. I stuck to the inside/shorter edge of the course and just kept truckin'. There was a small hill now that wasn't too steep or long and the wind wasn't really a factor. I decided that I had to change up my plan from the slower mile/faster mile from before. I started doing shorter segments of faster and slower paces. Instead of a mile, it was more like 1/5th of a mile fast and 1/5th of a mile slow. It worked for me and that's all that really matters. I was still feeling good, surprisingly (VERY surprisingly). The course from mile 24 to about 25.5 seemed like forever long but I was passing people, which felt good, and knew that I could hold on till the end because I was nearly there. Easy! I passed the finish in 3:07.26, or something like that. I am very happy to have another Boston qualifying time in the books. It was a fun race and I wouldn't mind coming back. Short story: Went in knowing I wasn't perfectly trained and ended up doing pretty well (but not surprisingly well). So I don't know really where to start this story but let's just say that most of the time I would have done as little work as possible in terms of picking up the bib and getting to the start. I was quite surprised that the day before the race the packet pick up place was also offering 20% off nutrition products if you went to the early bib pick up. Well, that did it for me. I had my eye on some sports drink for probably well over a year and was waiting and waiting for my chance to not pay full price for it. Well, I got it. I mixed some of it. And then within the first mile of the race I threw it on the ground. No joking. The morning of the race went pretty normal. I got up and showered and shaved and made sure I put on some of that anti-chafing stuff. I had my normal chips, pbnj, banana and some gummy bears. On my way out of my house to my car I was struck with a problem I didn't even anticipate: was I going to need a headlamp? I really hadn't even thought at all about this. But I did have 2 headlamps with me, but would I actually start the race with one on my head? After getting to the start and all that normal stuff the race started with out a lot of fan fare. Just the race director saying "thanks for giving me your money." After a short list of announcements we were off. My strategy for this race was only to not go out too fast and just get to the finish. I didn't have the confidence that I was going to be able to pull out any last minute magic so I just kept going as best I could. So the first part of the race was rather dark but this is the part where most people are closer together and I was able to enjoy the benefits of other's headlamps and before I knew it the sun was making plenty of light. The first 2.5 miles of the race is basically up a steady grade, not a tough hill but a hill nonetheless. I was making my way up just fine when I was struck with the thought that I have had at other races: why am I carrying 2 pounds of water on my chest while climbing this hill? I knew the first aid station wasn't far and before I though much more I dumped most of my liquid because I didn't think it was necessary to carry it with me and I wanted to not waste the energy to do so. So there goes a few cents worth of my new sports drink I had been waiting over a year to enjoy. Oh well. Well, the race is on Antelope Island and if you don't know much about the island let me just say that it is pretty in a unique way. It's not a must see national park and there aren't blindingly tall trees and majestic canyons or rock formations. It's an island surrounded by the salt lake in the middle of a desert. There's a lot of short grass and bushes. There are some trees on the island higher up on the mountain, but they aren't dense and have to survive in some pretty harsh environments. Plus there was a fire last year that burned a good half of the south part of the island and some evidence of the fire can still be seen. Sometimes when I'm out there trudging around I'm convinced that scenes from Mordor from The Lord of the Rings could have been filmed there. Just this short grass surrounded by exposed rocks and on an overcast day can look quite dreary. Well the weather forecast for race day was set to be hot, and it was. After the first 25miles the effects of the heat really set in. The course was still heading south and running into the wind was nice and it helped. On this part of the course I was actually pretty happy with my performance. My energy levels were decent and I was able to keep a decent pace. I was hoping that the ranch would be soon but it wasn't. The ranch is the next turn around point at mile 33 and it is really far. Well, I made it out there. I drank as much as I could and ate some junk food which this race my normal grab consisted of cheeze-its and m&ms.. I also ate some orange slices when I could. Soon after leaving the ranch at mile 33 the heat really set in. There wasn't much in the way of wind while running north and it was pretty tough. All I could really do was to focus on moving forward and try to make more running steps than walking steps as each mile moved on. For the first miles after this point I decided that I would try to run a full mile and then walk/run the next mile and try to go back and forth. It actually kind of worked until about mile 40. Looking at my splits it isn't really evident, but it really doesn't matter. After passing the lower Frary aid station the 2nd time, about mile 38, I tried to keep up and just move. I was focused on getting to the fence where I knew I could just hike up the course along the fence up the hill and then get a chance for some level road/trail until the end. One I got to the fence and up the hill I passed someone who was probably not feeling much better than me. And at the same time I got passed by someone else who seemed to be doing much better than I was. Well, not much to do at this point, I was pretty tired and just had to run my own race and not let anyone else get to me. Well, I ended up passing them again before the next aid station and then, to my surprise they didn't pass me again at all. Wow. Now that I think about it the people that I passed in the last 10 miles I'm not even sure which event they were running. They could have been 100 milers or 50 milers. I didn't really inspect bibs as they passed me or I passed them. Well, after the last aid station the trail gets really interesting. It's rocky and has a lot of turns. It surprised me and it kind of thew off my rhythm of walking 25 step and running 100 steps. But no big deal. It was just me, the heat and the trail and about 2 miles to go. Just go I had to tell myself. By this point I was about 1 hour behind my desired finish time but I guess my estimates were just too big for me. But I'm not disappointed or upset. I had a great time out there. I'm glad that I never really descended into darkness and absolutely hated life like I did on my last 100k. No serious nausea or stomach problems. I did sort of lose my appetite at the last aid station but I was still drinking and I know that helped a lot. Not sure if this race is calling me to come back yet, but it is a close race to my house and it really couldn't hurt to try and do it again. I'm Morgan. I like to run. A lot. Follow me for race reviews of marathons, trail races and ultra marathons around the Western US, especially Utah.